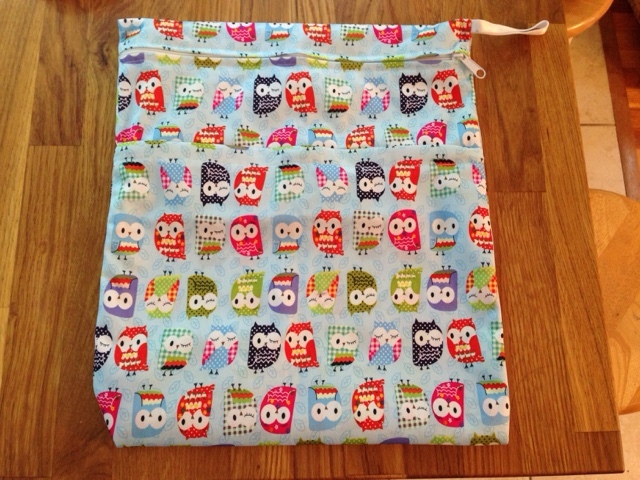 Now I'll let you in on a little secret, it's actually a wet bag for cloth diapering but I have so many other uses for it. It has a larger waterproof compartment and then also a smaller zippered area in the front. When we are heading to the beach or pool I put tissues, Blistex, my ID, etc in the front pocket and then a change of clothes for the kids in the large section. When the kids are done swimming, they change and I put the wet suits in the waterproof section. No more remembering to bring plastic bags or dealing with wet clothes making everything else wet in a bag. Everything in the front compartment stays perfectly dry. The bag is big enough that I can cram a change of clothes for 3 kids and myself (we're talking shorts and t-shirts - not bulky items) in the bag. I then throw that bag in my larger beach bag which has towels, sunblock, etc. I also like that it keeps the change of clothes separate, dry, and not sandy instead of just thrown loose in a big bag. Beyond beach/pool days, I also use the bag for snacks and toys on the go. I also like that I can throw water bottles in it on a hot day and not have to worry about them sweating condensation all over my bag. So there you have it, the hottest fashion accessory of Summer 2015 - a wet cloth diaper bag (what an exciting life I lead!). If you want to grab one for yourself you can check them out on Amazon HERE. Also, if you're not a Prime Member click HERE to find out about a 30 day free trial . *Disclaimer: I bought this product, loved it, and am sharing it with you. No compensation was received for this post.